In this cluster we will be delving into texts and practices that explore the limits and potentials of vocal expression. We will be looking at two texts that approach questions of voice and silence/ing through very different entry points; that of the non-human semiotic worlds of the rainforest, and that of the gendered politics inherent in determining how and whether voices are heard. Departing from their respective practices dealing with the question of the voice, Aurélie Nyirabikali Lierman and Amelia Groom will guide us through experimental and in-depth discourses that may broaden our perceptions of where we hear voices, when we speak up, and when we deliberately deploy silence. 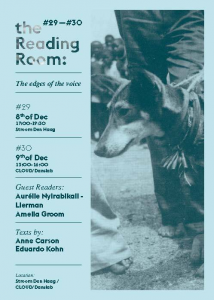 The second part of the cluster is a workshop led by artist/vocalist Aurélie Nyirabikali Lierman, in which we will explore the texts and our many voices, by assembling an experimental “non-human choir”. Aurélie will guide us through physical and vocal exercises focusing on onomatopoeia, non-linguistic sounds, and the untapped possibilities within the repertoires of our non-adult and non-human voices (baby, animal, spirits, etc.). The workshop is suitable for complete beginners as well as professionals in the fields of vocal practice, and is open to participants of any age. There are a limited number of spaces available for this event. As this is a discussion, you are expected to have read the provided texts before attending. Please reserve a spot by sending an email to platformtm@gmail.com. We will also provide you with a copy of the texts once you have RSVP’d. 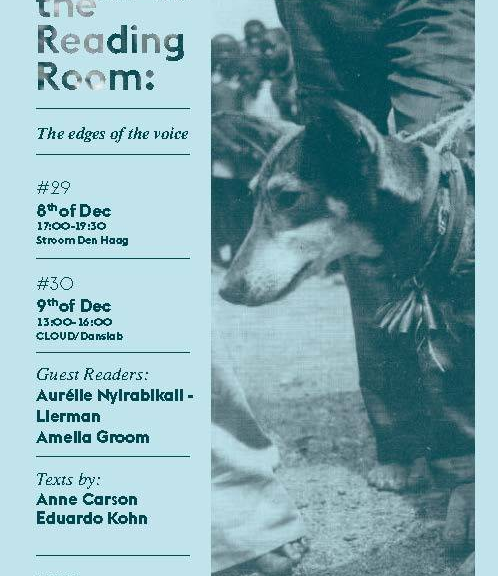 The Reading Room is organised by Jonathan Reus, Sissel Marie Tonn and Flora Reznik. With thanks to support from Stroom Den Haag and the Dutch Creative Industries Fund, and our production partner the Instrument Inventors Initiative. Amelia Groom is a Berlin-based writer, and currently a postdoctoral research fellow at ICI Berlin Institute for Cultural Inquiry, where she is working on an art historical project about stones. Since 2014 she has taught on the Critical Studies MA at the Sandberg Institute in Amsterdam, and she was also the theory tutor for the Master of Voice programme at the Sandberg (2016-2018).